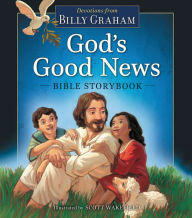 God's Good News Bible Storybook with Devotions From Billy Graham combines excerpts from the bible and pairs them with adapted selections taken from Billy Graham's writings. Unlike other bible storybooks for children which oversimplify the stories of the bible to such a great degree that they conflict with scripture, this new children's book integrates scripture text. For example in the story "Sermon on the Mount", not only is there a scripture reference, the story itself is taken from the wording of the bible. Added words used for clarification are italics. This is to allow a smoother transition or greater clarity for children who are reading the story. This is a refreshing approach to the bible in contrast to the liberties many authors take when they talk about Jesus or the apostles being "happy" rather than "blessed". Scott Wakefield's illustrations are bold and colorful. The art is intended for children- with the simple and expressive faces, yet not too oversimplified as many of the hastily drawn cartoon figures seem in many bible storybooks on the market. The bold use of color within the art and the pages draw in younger readers as well as parents. Nevertheless some purists may not appreciate the free-styled artwork in favor of something more traditional. Overall for those parents looking for an accurate, reliable children's bible- this is it! This is best choice on the market that I have seen so far. The added devotional selections help children as well as parents apply spiritual principles to real life. As a blogger for Booklook I received a copy of this book published by Tommy Nelson for the purpose of writing this review.